Have I mentioned that we recently started composting? I honestly don’t really know a ton about it. Like most of our outdoor projects, Joey took the reigns on this one. What I do know is, we have our big compost bins outside and we keep a small lidded pail inside. The indoor pail is where we throw anything compostable… Vegetable clippings, coffee grounds, etc. then every day or two, Joey empties them into our outdoor compost bin and stirs it all up. The other day, I opened the indoor pail to toss in a banana peel. And as if cued by some invisible maestro, a SWARM of gnats ascended up from the pail and into my face. I screamed. LOUDLY. It was freaky. It felt like it was happening in slow motion. The swarm slowly rises from the rubble and acosts unsuspecting homeowner. Ugh. So gross. And they weren’t normal teeny gnats. They were chunky. They had some girth to them. (shudder!) I still get the Heebie-jeebies thinking about it. For days after that, Joey and I found ourselves swatting at an impossible number of gnats. We were in battle. And I think we were losing. We suspect that something must’ve laid eggs in the pail, which then hatched because we’ve never experienced this many gnats in our home. EVER. 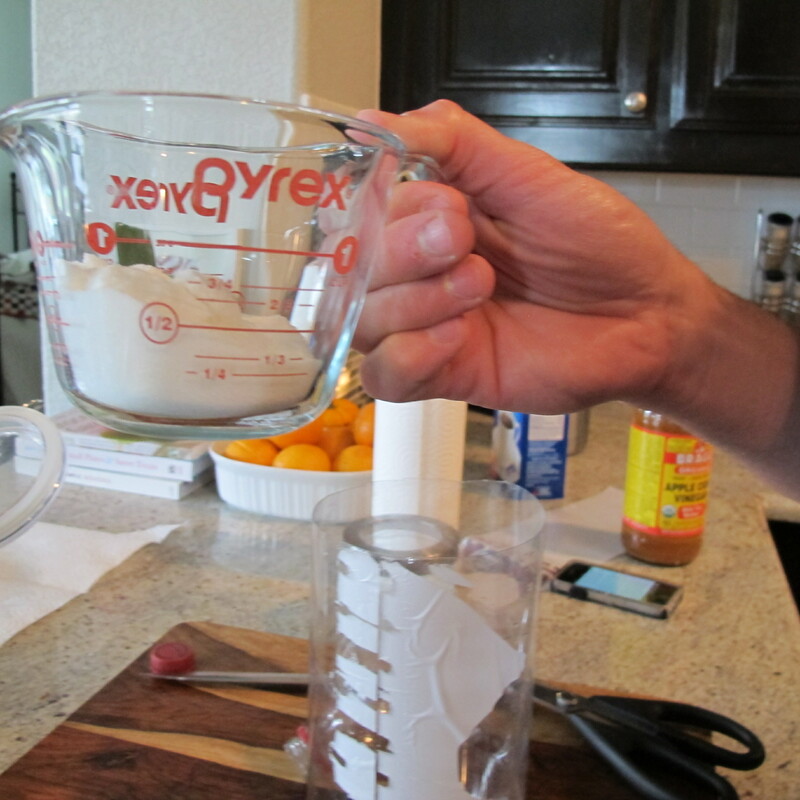 By this point, we’d pretty much had it, so Joey went online and found this tutorial. 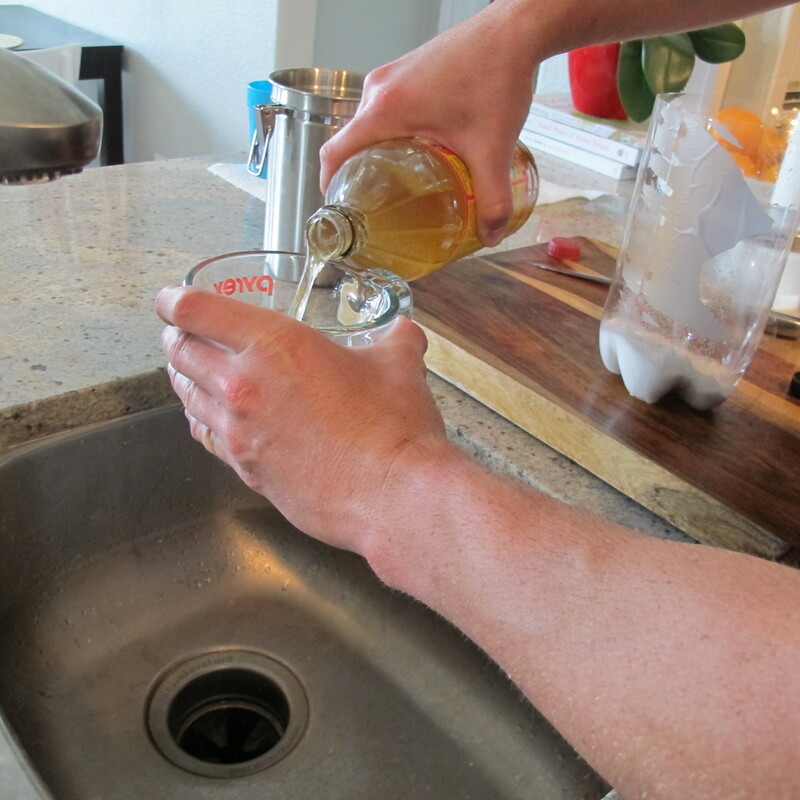 Here’s what he did… He started by emptying a 2-liter soda bottle that had long since gone flat. 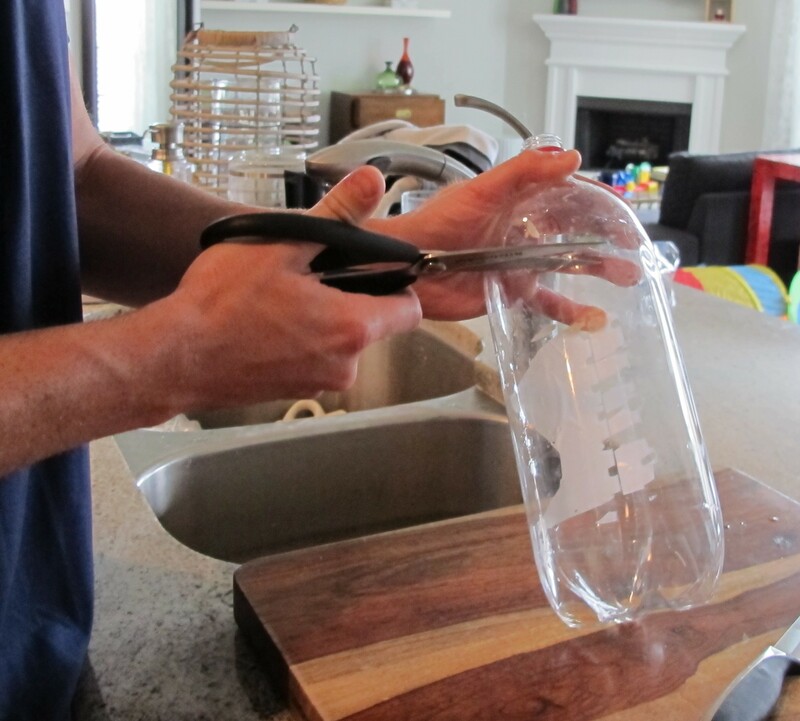 Then, after rinsing it out, he simply cut the top off with scissors. 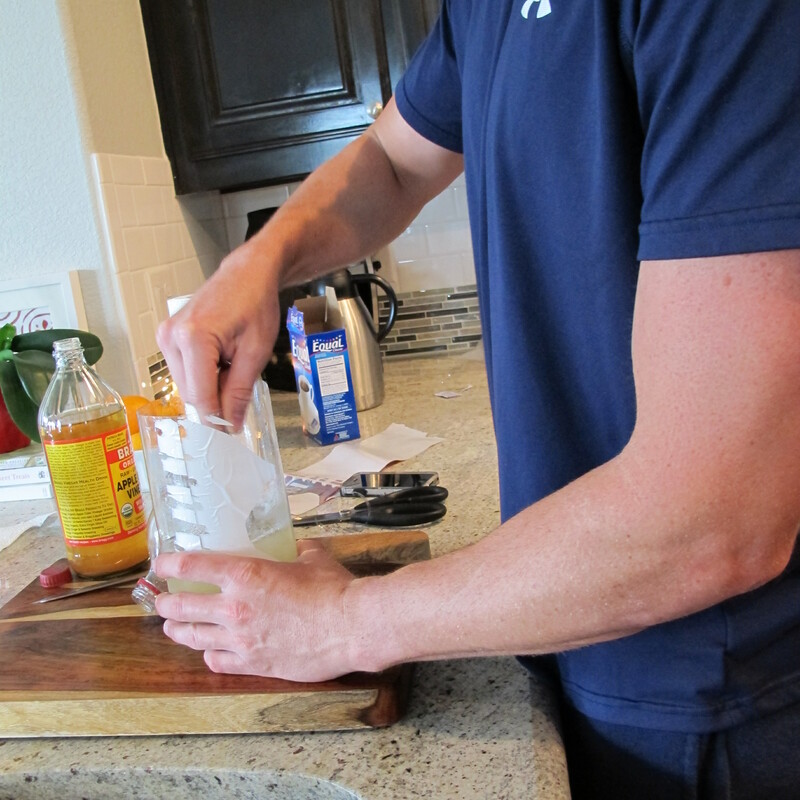 He filled the bottle with 1/2 cup sugar and 1/2 cup apple cider vinegar, then added a splash of water and stirred. Then, we placed the bottle next to our trash can to attract gnats. 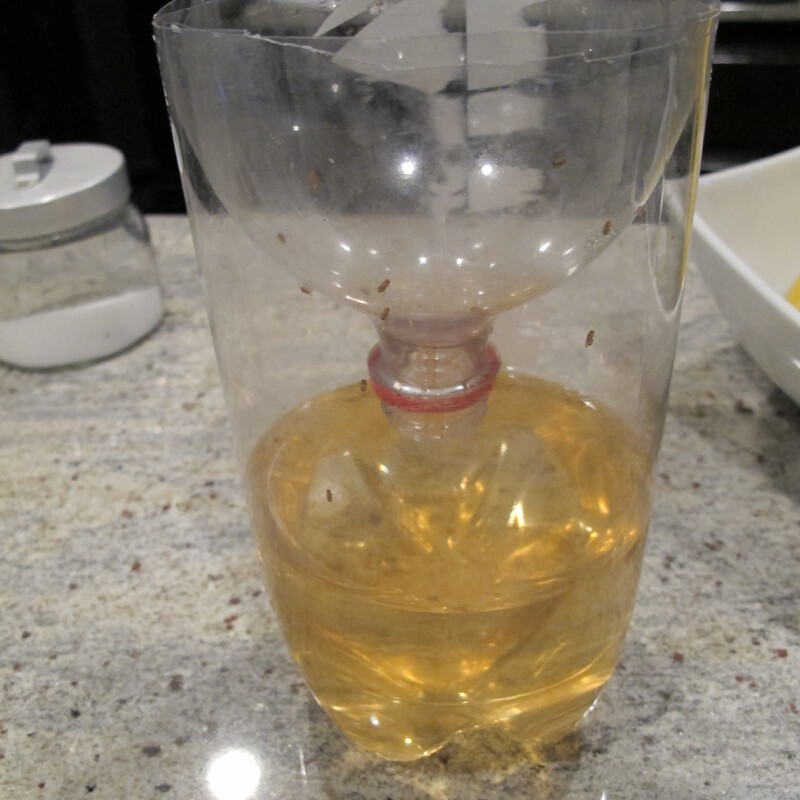 We moved the trap around the house occasionally, if we happened to notice a large concentration of gnats in one particular place. 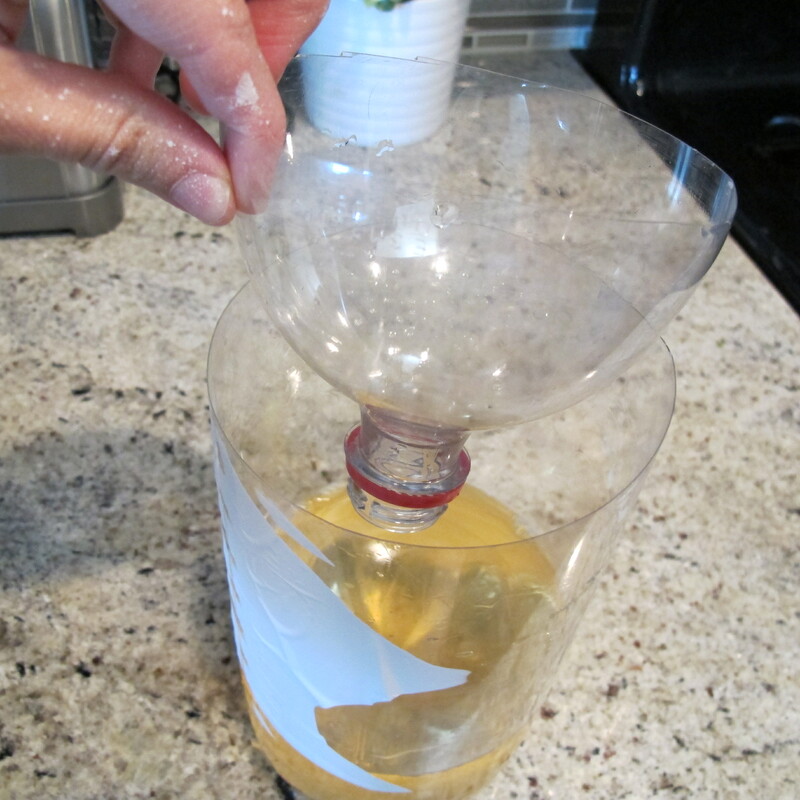 The idea is that the gnats are attracted to the vinegar/sugar, fly into the bottle and can’t get out. I have to chuckle when I imagine the gnats all “Hey guys! Hurry up! This way!! I found the jackpot!! Um ….oh. Wait. Ummmm….” Hahahahahahaaa!! See?? That’s how much I hate them. Oh, yeah. It worked. This pic was taken about an hour after we set the trap. And it continued to work after that. In fact, we hardly noticed any gnats around the house within about a day or so. Maybe a stray loser here and there, but nothing crazy. And we continued to note more and more gnats in the trap over the next few days. It just kept working. We couldn’t believe that after all the swatting we’d done that there were still so many gnats living among us. So, I’d definitely say that the 5 minutes and zero dollars spent which saved our sanity was completely worth it. This trap was for the win! Two thumbs up and a standing ovation. And now, our indoor pail gets to live in our garage. Lesson learned. You should call the trap “The Hotel California” “They can check in any time they like but can never leave!” Again, another great idea! Hahahahahahaaa!!!! Nice one! Ill do that next time.